Series may head back to World War II. Glu Mobile sent us fun facts about its smash hit mobile series, Frontline Commando. Then at the end, the company announced a new game, Frontline Commando: Road to Berlin. No details, mind you. What a tease! For now, you can enjoy the following info about the franchise. For starters, the games have been downloaded 78,000,000 times, which is insane. 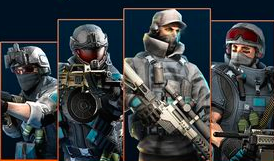 Beyond that, and focusing specifically on Frontline Commando 2, the Launcher is by far the most popular squad mate with 493 million, followed by the Drone (469 million), Grenade (218 million) and Medic (181.5 million). In addition, 144,788,014 RPGs have been fired, along with 63,517,806 drones deployed. Gamers have used 21,888,145 medkits, and tossed 27,779,832 frag grenades. We'll have info on Road to Berlin as soon as Glu reveals it.